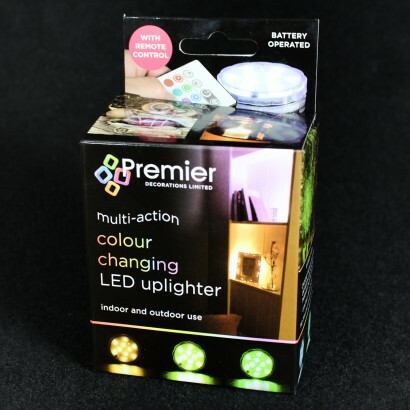 A quick and easy way to introduce colourful lighting into your home, the colour change uplighter contains 10 colour change LEDs that shine from the discreet unit to cast stunning mood lighting effects. Remote controlled, the submersible unit can be placed on shelves, behind pictures and can even be placed inside vases to highlight flower arrangements and create striking table decorations. 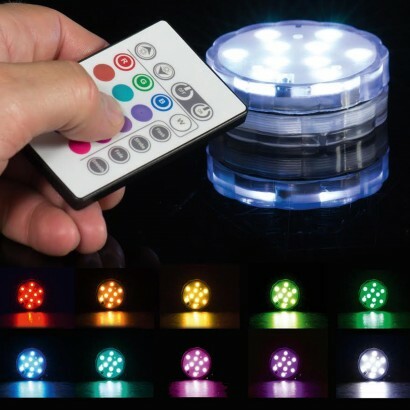 A fantastic all rounder, this handy unit can be used indoors or outdoors, is battery operated and you can choose from multiple effects from colour changing to hold on you favourite colour. Visually very impressive for their size, battery life a bit disappointing. ...........to give as a present which is what I originally intended. Brilliant, simple concept, neat and stylish design, great value for money and so restful and comforting when glowing away. I just loved these uplighters, so I kept them for myself and bought something else for the present. We ordered these fabulous little lights for a customer commission. They arrived and are brilliant. However, there was a minor fault with one of the colours, upon calling to report this issue, no argument was offered and a replacement is on it's way. Magic ! Great products and fabulous customer service. Highly recommended. Very pleased with the uplight especially the fade it sits behind my house plants. It would be better if it could work of mains electricity.